ATLANTIC CITY, N.J. (July 31, 2018) – The newest entity in MMA, MMA Pro League, has set the first seven matches that will take place at their inaugural event Saturday, September 15 at the new Hard Rock Hotel & Casino in Atlantic City and streaming live on FloCombat.com. The September 15 event will pit fighters from Team New Jersey, which is led by head coach Dan Miller of the Miller Brothers, against Team Pennsylvania and their head coach, Daniel Gracie of the renowned Gracie family. 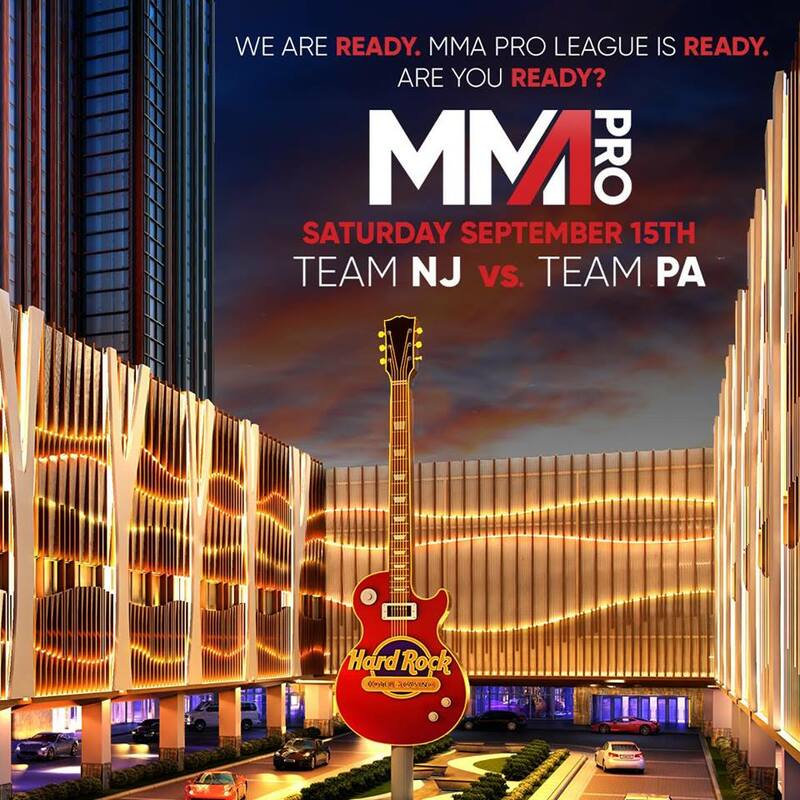 “We are very excited to announce these first seven matches for our inaugural MMA Pro League At The Hard Rock event on Saturday, September 15,” said MMA Pro League CEO Hani Darwish. “The fighters are proud to be representing Team New Jersey and Team Pennsylvania, and are committed to giving the fans a great show that night.” Darwish and MMA Pro League President Mark Taffet are leading the efforts for this newest addition to the professional team sports landscape. MMA Pro League action will see Claudio Ledesma taking on Andre Bernardo in a flyweight fight, Gabriel Ruiz in a bantamweight clash against Cody Hier, the professional MMA debut of Francisco Muniz as he takes on Joe Schick at a 140-pound catchweight and a women’s bantamweight showdown between Erika Bobier and Kylie O’Hearn. Rounding out the lineup of fights that are currently set are Sodik Ismoilov battling Andrew Salas in a featherweight attraction, Mike Pagano in a featherweight bout against Zedekiah Montanez and a middleweight contest that pits Emmanuel Walo against Rafael Celestino. Additional fighters and matchups will be announced for the September 15 event in the weeks leading up to fight night as coach Miller and coach Gracie prepare their teams for the groundbreaking night of action. Tickets for the inaugural installment of “MMA Pro League At The Hard Rock” will be available at Ticketmaster.com starting August 1. Ledesma is a native of West Orange, NJ and currently holds a 14-7 record as a professional fighter. Bernardo is originally from Botucatu, Sao Paulo, Brazil and has a professional record of 8-4. Ruiz fights out of Woodland Park, NJ with an 0-1 record as a professional fighter and an amateur record of 5-2-1 in the flyweight division. Hier is originally from Davidson, MI. He later moved to Philadelphia to train at Gracie Gym. Hier has a record of 1-1 as a professional fighter in the bantamweight division. Muniz is originally from Caguas, Puerto Rico. His preferred discipline is Brazilian Jiu-Jitsu. Muniz has fought five times in his native Puerto Rico, attaining a record of 4-1. Schick, from Hamilton, NJ, was a Division 1 wrestler. He began fighting as an amateur in 2015. Within one year, Schick accumulated an amateur record of 5-0. He then turned professional and holds a 1-2 record in the pro ranks. Schick is also a middle school teacher in Fairlawn, NJ where he teaches science, match and social studies. Bobier has an amateur record of 0-1 fighting out of Michigan. She’ll be making her professional debut on September 15. O’Hearn recorded a 3-1 amateur record fighting out of Massachusetts. She will also be making her professional debut. Ismoilov, fighting out of Moscow, Russia, has a record of 1-2 as a professional fighter in the bantamweight division. Salas is affiliated with Wilkie’s Warriors, based in Bridgewater, NJ. He currently has a 5-1 record as a professional fighter. Pagano, a United States military veteran, is originally from Fayetteville, NC. He later moved to New Jersey to train with Dan Miller’s Miller Brothers MMA. Pagano is also a trainer at the gym and serves as the head instructor for the gym’s Little Spartans youth martial arts and anti-bullying program. He is a black belt in Brazilian jiu-jitsu with an 0-1 record as a professional fighter. Montanez is a mixed martial arts fighter based in Pennsylvania. He has a 3-2 amateur record as a fighter in the featherweight division. Walo was born in Cleveland, OH and spent the first few years of his life there before moving to Liberia at a very young age. Walo eventually returned to the U.S. to join the United States National Guard and was stationed as a guard in an Iraqi prison. While in Iraq, Walo was exposed to mixed martial arts and quick fell in love with the sport. When Walo returned home, he began training and made his professional debut int December 2010. He has accumulated a professional record of 12-2-1. Celestino is from Brasilia, Brazil and has a 5-2 record as a professional fighter in the middleweight division.